The Dreamcast Junkyard: Free games...that are good?!?!?!? Ah, the Dream On demo disks. You've gotta love 'em. Just when you thought you'd seen it all, they still throw up lovely suprises. For those not in the know, the Dream On demo disks were, well, demo disks that came free with the Official Dreamcast Magazine in the UK. Possibly in Europe too, but please - don't quote me on that. Today, I discovered something amazing. Whilst rummaging for a VM, I happened across Dream On volume 8. 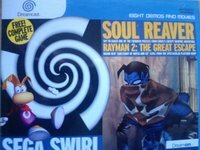 The fact that it features playable levels from the sublime Soul Reaver and heavenly Rayman 2: The Great Escape is not what caught my eye though. No, it was something a little more obscure: Sega Swirl. 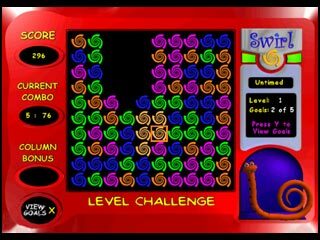 Sega Swirl is a free game that Sega distributed over the net and through the magazines and one which, until now, I had never even heard of. But what is it? Only one of the finest puzzle games this side of Tetris, folks! The premise is a simple one: the screen is filled with a grid of multi-coloured 'swirls.' By selecting a particular swirl and pressing A, it disappears - also taking with it any swirls of the same colour that happen to be in direct contact with it. When they disappear, the swils above fall down into the void left behind and that creates more combinations of adjoining swirls. As is the usual with this kind of puzzler, the bigger the combos you create, the bigger the points you can rack up. With my prose creation skills being as lacklustre as they are, that probably sounds really confusing, but trust me - it's gaming at the most basic level, and is a lot of fun. There are several different play modes availible, such as trying to clear the screen against the clock, taking turns to create combos against the Dreamcast, or - if you have any friends who will even touch a joypad that isn't attached to a PS2 (which I don't, the goddamned HEATHENS) - you can play a four player game in which you try to foil your opponents' attempts to get big combos by screwing up the layout of the swirls. When you're done with that, you may want to click here to read my review of Dragons Blood / Draconus: Cult of the Wyrm at Defunct Games - the net's premier retrogames review source; or here to view my lynching of Fighting Force 2. Just don't tell Eidos. Would you by any chance know where to d/l DC mag's coverdisks? Thanks Gnome. I don't really know where to d/l anything from to be honest. Can't get my head around that bittorrent thing and there isn't really anything on limewire. And in any case, whenever I do download something for the DC and burn it to CD-R, it never works anyway! Weird that... everything has worked fine for me.. till now that is. Have you actually used Discjuggler? yeah, but it's very rare that something I burn actually works. Usually, the Dreamcast just goes to the 'music' screen. 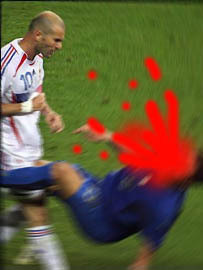 Bah! Weird that... No suggestions here, unfortunately. Rayman 2 is amazing. Soul reaver has the worst ending of a game ever. Nice, can't beleive I had smash pack for years and never gave this a shot. tomleece, ever tried Alcohol 120%? yeah, but waaaay to complicated for my tiny mind! Thanks for the comments guys! SEGA swirl is on web browser 2.0 here in the US. got it for $2.50 from goodwill(look it up if don't know what the place is). it's not bad and they have a version on the disc you can install on the computer if oyu want. there is also desktop pics and a file on the swirl thing can open in photoshop and do stuff.